A landmark moment calls for a photo opportunity. Celebrating the establishment of the Clinton County Legacy Fund are Clinton County Commissioners Kerry R. Steed, Brenda K. Woods and Michael McCarty, joined by Clinton County Assistant Prosecuting Attorney Andrew McCoy, the county’s legal counsel. It was a time to stand and shake hands. Clinton County Commissioners adopted a measure Wednesday to establish the Clinton County Legacy Fund. 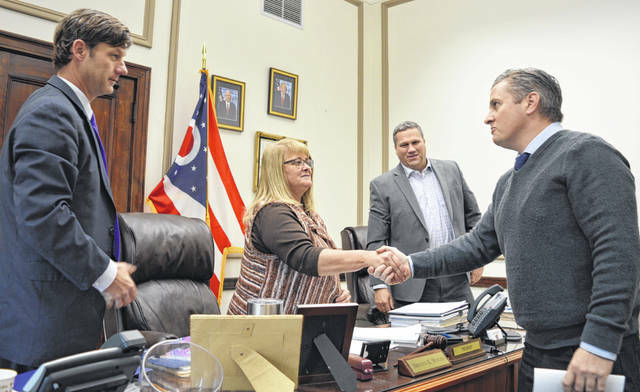 From left are Commissioners Kerry R. Steed, Brenda K. Woods and Michael McCarty, as they shake hands with Clinton County Assistant Prosecuting Attorney Andrew McCoy, the county’s legal counsel. WILMINGTON — Commissioners voted Wednesday to establish the Clinton County Legacy Fund, which will have a start-up amount of $10 million to invest and generate ongoing income for grants that benefit the community and its residents. The $10 million is part of the proceeds the county received from selling county-owned Clinton Memorial Hospital. Under the contract approved by commissioners, the not-for-profit Clinton County Foundation will be the steward for the Legacy Fund. The Foundation’s governing board is expected to give the thumbs-up to the contractual agreement. As approved by the commissioners, the agreement states the Grant Selection Committee will have five members, all Clinton Countians appointed by majority vote of the county commissioners. The makeup of the committee was an issue commissioners differed on in 2018 when then-Commissioner Patrick Haley strongly favored making it a requirement that the three county commissioners fill three seats on the five-person selection committee. Because awarded grant dollars will be based on the income actually generated by the invested principal — and not upon income projections — the first grants are not expected to be awarded until January 2020. Moreover, there still is work to be done before grant applications are accepted. Yet to be determined are: What information will be required in the application itself; what type of criteria will the Selection Committee use as the basis to judge the applications; how will the applications be “scored” as the application process will be competitive; and who will commissioners pick for the selection committee. The reason to move the money from the Board of Clinton County Commissioners to another entity stems from legal restrictions upon how a board of commissioners can invest the dollars. Due to those limitations, the board of commissioners could not generate as much investment income as can a charitable community organization such as the Clinton County Foundation. By opening the Clinton County Legacy Fund with the Foundation, the money can generate sufficient income to award grants that can have an impact, said Clinton County Assistant Prosecuting Attorney Andrew McCoy, the county’s legal counsel. The three commissioners indicated they regard the establishment of a Legacy Fund as some of their most important work as county commissioner. 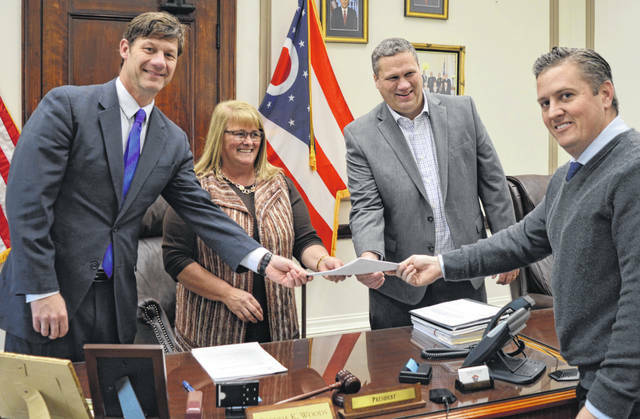 Chaley Peelle Griffith, a Clinton County Foundation board member, said Wednesday she thinks it is an exciting day for Clinton County, and she wanted to commend the commissioners for their cooperation and the trust they are placing in the Foundation. A Clinton County native, Griffith said Wednesday’s news got her to thinking about the history of the county hospital going back generations, and how that now going forward the Legacy Fund also will benefit Clinton Countians for years to come. The Legacy Fund is intended to be a permanent endowment fund. In fact, the contract does not permit any of the original $10 million invested as principal to be awarded. LEGACY is an acronym standing for Local Endowment for Governments And Charities for Years. The Clinton County Foundation was founded in 1985 as a charitable community organization with a 15-person governing board. The Foundation invests money to provide Clinton County organizations with financial support to continue the work that improves and enhances our communities, states the Foundation’s website. In round numbers, commissioners previously have spent hospital sale proceeds on the following: just under $9.5 million on outstanding county debt; $6.3 million in renovations to the county courthouse, county prosecutor’s building (former post office) and the county veterans service commission building (former county jail); $5.2 million on MARCS (Multi-Agency Radio Communication System) radio towers with digital communication for first responders and public safety providers; and $400,000 for a major software project for county government operations. A big chunk of the $82 million purchase price went toward the hospital’s bond debt, which was paid on the day of the sale: approximately $37.5 million.